Microsoft still hasn’t given up on feature phones, the new phone even bears the Nokia name. 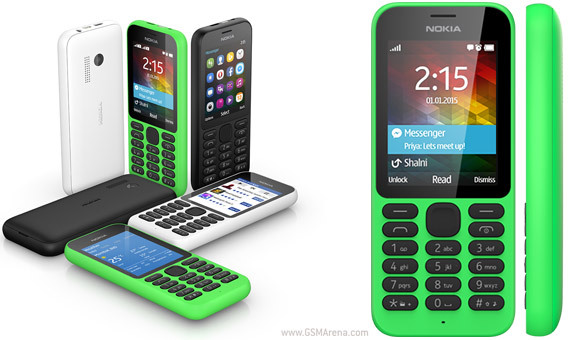 The Nokia 215 comes in single and dual-SIM version and offers essential Internet connectivity plus amazing battery life for just $30 (with no contract, but before taxes and subsidies). The Nokia 215 has Opera Mini for general web browsing and handles social networking with the Facebook app and Facebook Messenger, Twitter too. Bing Search and MSN Weather are also on board. All this web access happens over 2G and EDGE (dual band) on a 2.4" QVGA screen (240 x 320px). This is a Series 30+ device so it's a throwback to a bygone era. Additional connectivity includes Bluetooth 3.0 with SLAM (for easy file sharing). There's also FM radio connectivity and the Nokia 215 will last 45 hours. 50 hours if you're playing MP3 audio, there's a microSD card slot supporting 32GB. The 1,100mAh battery is good for 20 hours of talking and 29 days of standby for the single-SIM model. The dual-SIM lasts 21 days. For $30 you even get a camera – a 0.3MP one but still a camera. It records video at QVGA resolution and 15fps framerate. There's an LED but it's on top of the device used specifically as a flashlight rather than a camera flash. The Nokia 215 and 215 dual-SIM will go on sale "in select markets" starting with Europe, Africa, the Middle East and Asia. That is unless the Lumia 530 beats it there first, a Windows Phone that often gets heavily discounted (dipping to $50 with a contract).